Ubisoft has confirmed that its "always-on" DRM has been patched out of Assassin's Creed 2 and Splinter Cell: Conviction but says that new titles may still make use of it. A Reddit user revealed last week that the PC versions of both Assassin's Creed 2 and Splinter Cell: Conviction were suddenly and without warning able to run without being connected to the internet. 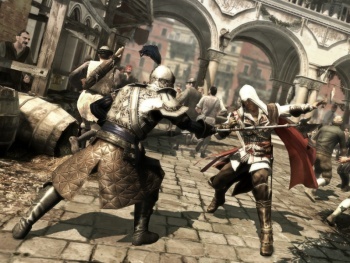 Both games had previously fallen under the iron fist of Ubisoft's much-loathed "always on" DRM, revealed to much anger in early 2010, which requires owners of Ubisoft's PC titles to be connected to the internet at all times while they play. Unlike similar systems which authenticate and operate, Ubisoft games running under the system cease functioning if the internet connection is lost. Ubisoft confirmed the situation today with Shacknews, saying that the DRM scheme in both games has been patched and will now verify authenticity at launch and then allow play to commence and continue regardless of network status. Unfortunately, it's not a full-stop resolution, as the Ubisoft rep said the DRM situation in its games will be handled on a case-by-case basis and that future games may still ship with an "always-on" requirement. It's worth remembering, however, that in August of last year Ubisoft opted to ditch its home-grown DRM scheme for the then-unreleased R.U.S.E. and go with the less obtrusive Steamworks system instead. Despite the "stay the course" attitude, it seems more than a little likely that Ubisoft isn't ready to throw in the towel mainly because it doesn't want to admit how badly it misjudged the response to its copy protection plans. Whatever the case, the new system isn't perfect - you'll still have to be connected to the net to actually launch your games - but it's a pretty big improvement. We'll see where it goes from here.